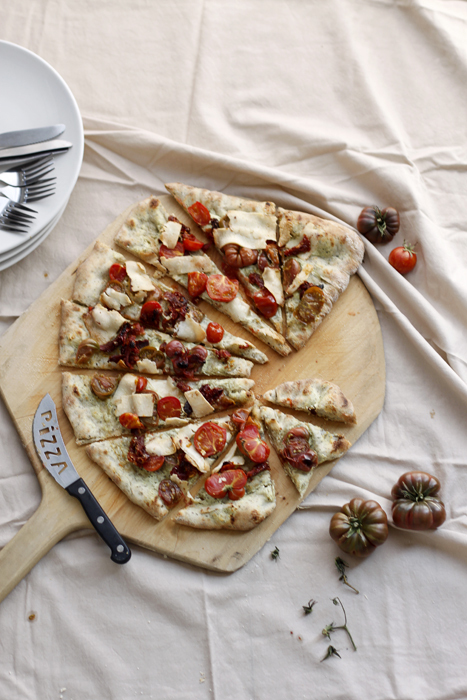 Heirloom Tomato and Cheese Pizza — always with butter. A pizza made from my many treats from the ferry building farmer's market. I made it a few days ago and my dad is making it again as I type, so I would say the recipe is a winner. 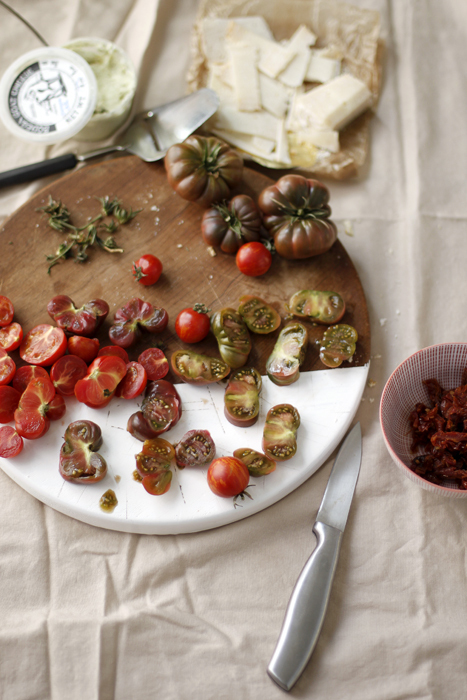 Don't you love these tomatoes? 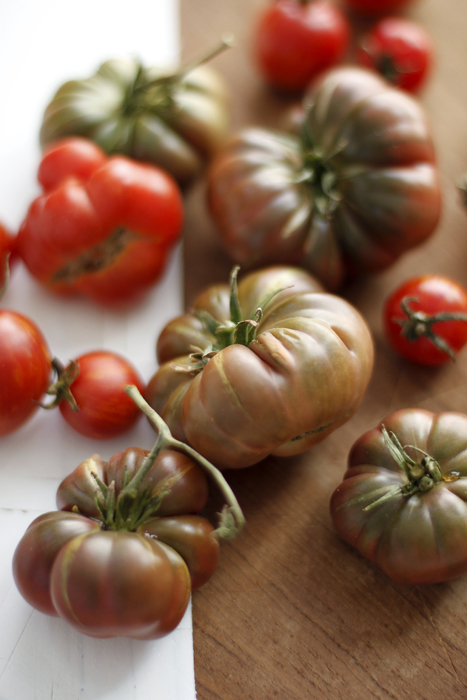 I always have loved the look of heirloom tomatoes but these ones being so small, the biggest one being about the size of a fig, I kinda love them more. They were from the market stall of the nice man who sold me the most precious little strawberries, a pie post made with them to come soon. I don't think that all the vendors at the farmer's market realize that if you are nice to the customers they will buy so much more from you. One stall that just sold apples, albeit their prices were a bit lower than some others and their apples looked amazing, the worker was rude as heck so I won't shop from them again. But the lovely man who sold me these tomatoes, I went back to three times, proves something right? The cheese is this recipe are a bit ferry building farmers market specific, but just substitute them for anything similar or do a google search to find a similar cheese. When making the pizza dough, it doesn't really rise that much. The recipe says to rise till it has doubled in size, but that never happened for me. Even after an additional hour of rising. I put the dough, in the bowl & covered with the towel, in the oven on 'warm' for about half an hour at the end of the rising time. That seemed to help somewhat but it still was not nearly doubled in size. So don't worry, it still tastes fantastic and it was a really thin crust, which I have always found hard to achieve at home. In a small bowl mix first amount of water, sugar & yeast. In a separate bowl, mix second amount of water, oil & vinegar. In a large bowl stir flour, salt & basil. Add both liquid mixes to the flour mix. Stir until a soft, shaggy dough forms, add 1-2 more tbsp of water if needed. Kneed on a lightly floured surface for 10 minutes, until supple. Place in a lightly oiled bowl, cover with a damp towel and let double in size, 2 hours. Place pizza stone in oven, on the lowest rack. Turn oven to as hot as it can go. Cut dough in half, then for each half roll out on a lightly floured surface to ¼ inch thick. Dust your pizza paddle with cornmeal, then place dough on paddle. 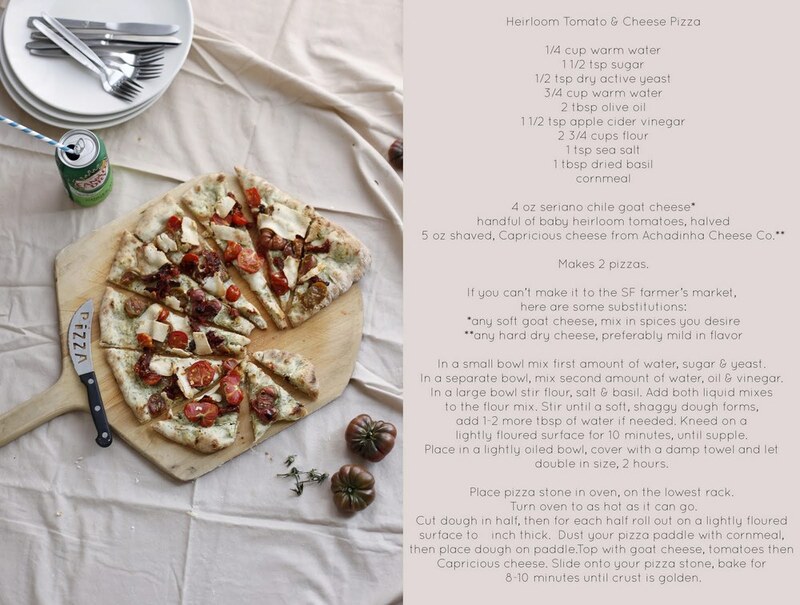 Top with goat cheese, tomatoes then Capricious cheese. Slide onto your pizza stone, bake for 8-10 minutes until crust is golden.